Moviegoers can also experience the smells of the film as well, with a special process called "Odorama", not unlike the efforts attempted by B-movie hucksters in the 1950s and 1960s (and, more recently, John Waters in the early-1980s). Apparently, the Odorama stunt will tie in with a scene where Spike loses his smell, and, probably, counts on the audience to help complete his mission. 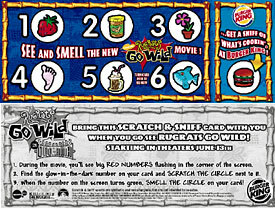 Special numbered cards, each representing a particular smell (smelly feet, strawberry, peanut butter, a flower, a root-beer float and a fish; sorry, no used diaper smells) were given away with kids' meals at participating Burger Kings starting 6/2/2003, until 6/29/2003 (see below), and separately at Blockbuster Videos starting 6/15/2003. Participants pick up the cards, then take them to the local movie theater showing the film. When a particular number flashes on the screen, viewers scratch off the scent that has that particular number on it. Numbers flashing in red mean that the viewer should find the corresponding number on their card (glow-in-the-dark for their convenience), and be ready to scratch-and-sniff when the on-screen number turns green. 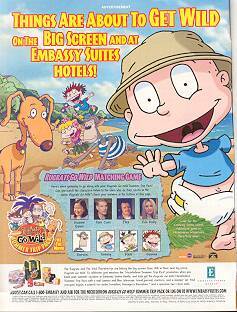 In May's Nick Magazine, Embassy Suites has placed another ad for their promotion, including a match-the-voice game (please note that Tom Kane (a.k.a. Darwin) has his last name spelled "Cain"). To see a larger version of this ad, click here. The ad also mentions that there will be another game in the June issue. Embassy Suites is also co-sponsoring a special contest where 5 lucky winners will receive a 7 day, 6 night, round-trip vacation for 4 people to an Embassy Suites hotel in Puerto Rico (top right), where they'll also receive US$1000 cash, plus join the fun at a special "island party" (Total Value: US$6800 for each prize package). 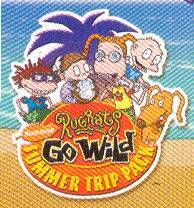 500 people will win a consolation prize -- a "Rugrats Go Wild Island Survival Kit" (bottom right), consisting of a bag, frisbee inflatable mattress, waterbottle and goggles -- all emblazoned with the "Rugrats Go Wild" logo (Total Value: US$15 for each prize package). Participants aged 5 to 15 years may enter either by mailing their entries in, by buying specially marked Cap'n Crunch or Life cereals, or online at Nick.Com. 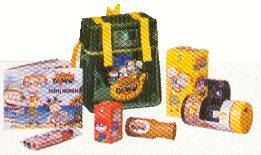 Starting in June 2003, Burger King restaurants in the US, Canada and some Caribbean countries will be offering special kids meals related to the film -- each of them, of course, including a free toy. I'll have more information on these toys here, as they become available. Burger King will also be offering scratch-and-sniff cards for movie-goers to take with them when they go see the film (see above). Starting in May, Cap'n Crunch cereals will offer a special Rugrats Go Wild version of the cereal, complete with "berries" shaped like the characters from the film, which change color in milk. Also, Quaker Instant Oatmeal will also publicised the home video release of the film, starting in September. 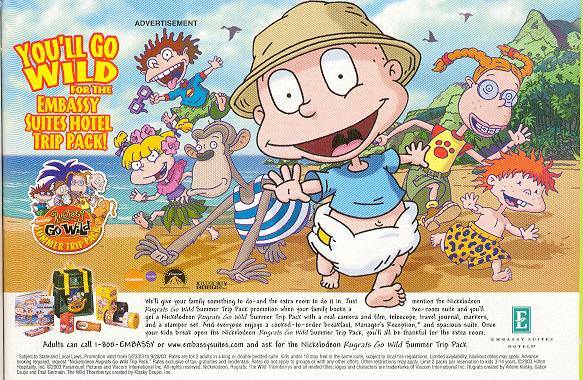 Beginning 6/1/2003, Kid Cuisine will offer two limited edition Rugrats Go Wild themed kids meals including Rugrats-shaped pasta, jungle animal-shaped fruit snacks, comvee-shaped and binocular-shaped breaded chicken patties and vanilla pudding with color changing beach sand sugar and palm tree spinkles. 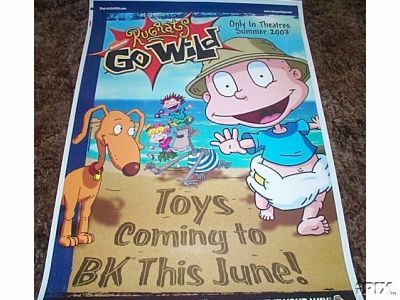 Also, boxes of Kid Cuisine's regular meals will feature special game pieces to be used for the Rugrats Go Wild Ultimate Island Adventure game boards, which will be published in the June 2003 issue of Nickelodeon Magazine, and will also be available at Nick.Com. 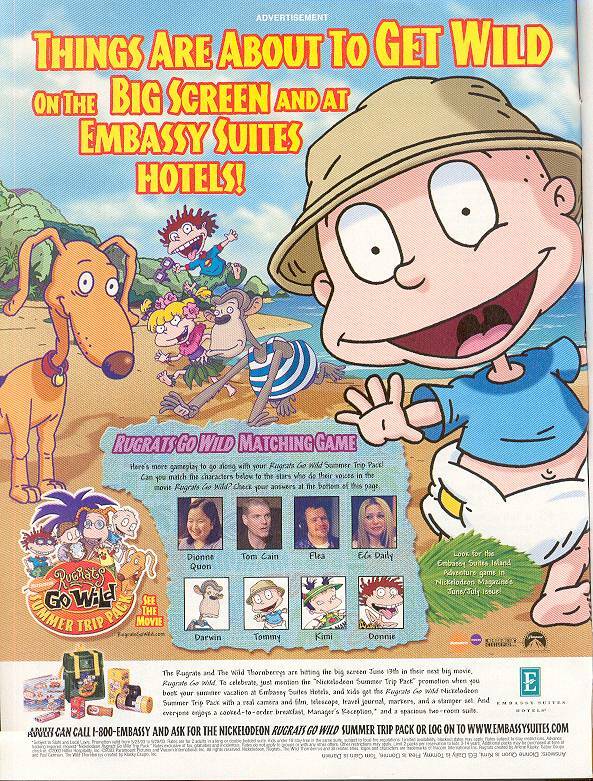 And starting 6/2/2003, Kid Cuisine will launch their "Ultimate Island Adventure" sweepstakes, where one lucky winner will win a trip for a family of four to the Beaches Boscobel resort in Jamaica. Thousands of smaller prizes will also be awarded. Sunkist, will be conducting 2 contests -- one for consumers will give them a chance to win a US$25,000 vacation package, while another contest, for schools, gives them a chance to win US$2500 in sports equipment for the school. Sunkist will also be including one of 6 trading cards in each specially-marked bags of Sunkist's citrus products -- each card will include facts and recipes. Skippy will offer one of 4 bobbleheads based on the film -- Spike, Tommy, Donnie, and Eliza -- free, with 2 proofs of purchase from 18-ounce jars of Skippy Peanut Butter or packages of Skippy Squeeze Stix. Valpak, the people responsible for those blue, junk-mail envelopes containing coupons and flyers from local merchants in the US & Canada, will hold a sweepstakes, awarding lucky winners to Universal Orlando. Also, screening passes will be included in randomly-selected envelopes. 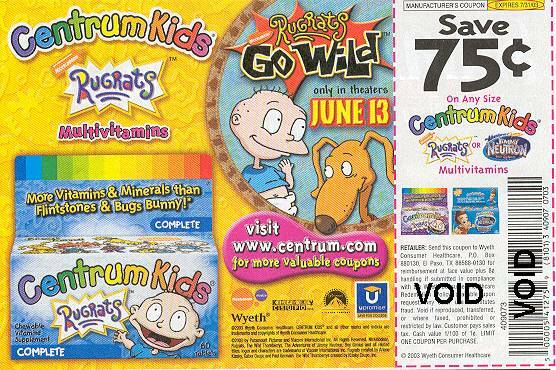 Some sponsors, such as Centrum Kids (above), will also have tie-ins to the film. In addition, count on toys from Mattel, video games from THQ, coloring books from Golden Books, and a soundtrack from Jive Records.